Washington State, 10th in milk production nationally, is also at the top of the list for greenhouse gas (GHG) emissions produced from dairy cattle. According to the latest statistics by the EPA, in 2012 Washington State ranked 8th in methane (CH4) emissions from dairy manure management and 12th in nitrous oxide (N2­O) emissions (EPA, 2014). Understanding the effect the dairy industry has on climate change has led the state to leverage its many public research institutions and agencies including the Washington State Department of Agriculture (WSDA), Washington State Department of Ecology, and Washington State University’s Center for Sustaining Agriculture and Natural Resources (WSU CSANR) to help dairy farmers better manage and mitigate GHG emissions on large scale dairies also known as concentrated animals feeding operations (CAFOs). One way farmers in Washington State have reduced their carbon footprint from dairy operations is through the use of anaerobic digestion (AD) technology to capture and divert CH4 emissions resulting from manure management practices. Though AD is typically adopted on dairies to better manage waste and produce saleable renewable energy, an added benefit is that it reduces CH4 emissions from manure management practices. However, from an overall GHG reduction standpoint, the majority of dairy digesters in Washington State reduce only CH4 emissions from manure management, while other sources of GHGs, such as N2O emissions from manure management and carbon dioxide (CO2) emissions from transportation and synthetic fertilizer production, continue. To further reduce the carbon footprint of CAFO dairies, these other emission sources must be targeted as well. One way that WSDA, Ecology, WSU and CSANR have helped farmer’s further decrease the carbon footprint of CAFOs is by developing and integrating additional technologies with digesters—essentially turning manure-only digesters into dairy waste biorefineries. Figure 1 illustrates this transition from a traditional dairy digester to a dairy waste biorefinery. At a traditional CAFO dairy digester (top image in Figure 1), CH4 can be captured from manure management practices via AD and combusted to electricity (grey bubble). Though this is a significant step in the right direction for mitigating GHGs on CAFOs, other GHG emission sources still remain unmitigated (orange bubbles). A dairy waste biorefinery takes advantage of additional technologies to produce value added products and also target these other GHG emission sources. 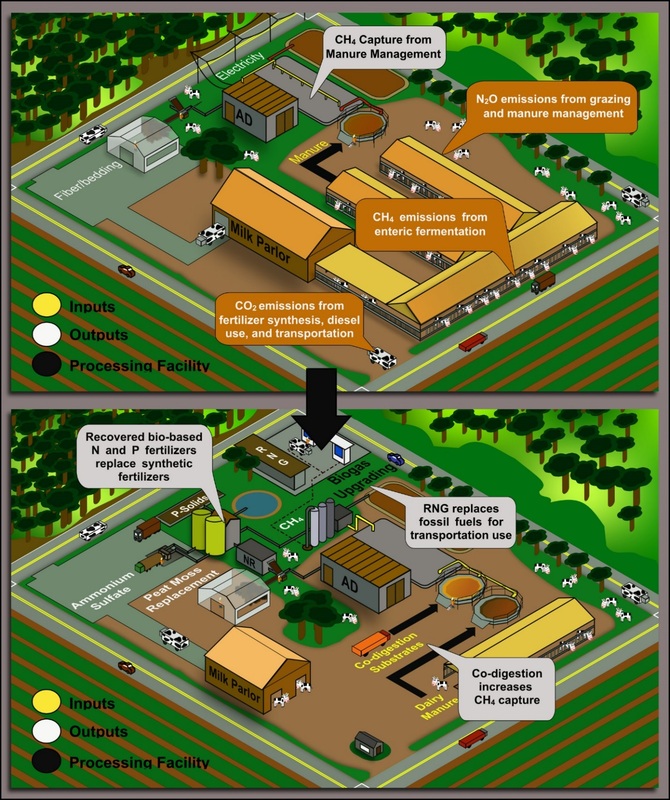 Depicted in the bottom image of Figure 1, the biorefinery still has an anaerobic digester at the heart of it (labeled AD) but additional technologies are added downstream to produce multiple products that can pay for capital and operation costs as well as provide additional revenue (above a baseline electrical generation scenario) to the farmer or project developer. These “add on” technologies also further decrease a CAFO dairy’s carbon footprint. Greenhouse gas emission mitigation can be increased by (1) increasing the production and capture of CH4 through the incorporation of off-farm high energy organics such as food processing wastes (labeled as co-digestion) if these would typically be sent to landfills, (2) replacing GHG-intensive synthetic fertilizers with on-farm fertilizers (bio-based nitrogen and phosphorus fertilizers) and peat moss with a peat moss replacement via nutrient recovery technologies (labeled NR), and (3) displacing fossil derived fuel with RNG that is purified and compressed to CNG standards (labeled as biogas upgrading and RNG). How does it impact GHG emissions? To demonstrate how effective dairy waste biorefineries could be at reducing GHG emissions in Washington, researchers at WSU CSANR took empirical data from a commercial dairy digester in Washington State and expanded it to 40 hypothetical dairy waste biorefineries, all operating with 20% co-digestion and utilizing WSU’s AIR-TRAP nutrient recovery technology. The total number of cows for this scenario was 70,000, which accounted for roughly 28% of the total number of cows in the state in 2010, when the study was conducted. Methane capture from the AD of dairy manure totaled 342,000 metric tons (MT) of CO2 equivalents (CO2e) per year (or the equivalent of removing roughly 67,000 vehicles from the road), while the introduction of off-farm organics captured an additional 611,000 MT CO2e per year (or the equivalent of removing roughly 120,000 vehicles from the road). Peat moss replacement from separated AD fiber and bio-phosphorus and bio-nitrogen recovered using WSU’s AIR-TRAP system had a GHG savings of 36,100 MT CO2e per year (over 7,000 vehicles removed per year). Finally, electrical offset mitigated 114,000 MT CO2e per year (over 22,000 vehicles removed per year). The study did not include the GHG mitigation potential of upgrading biogas to CNG but based off of other reports and models by Han et al. (2011), switching to CNG should increase the total GHG mitigation potential since CNG can replace fossil derived fuels that are utilized by hauling trucks at the dairy operations. Total GHG savings projected by the study equated to over 1 million metric tons of CO2e per year (over 196,000 vehicles removed). From a statewide perspective, this would roughly reduce GHG emissions by over 1%, thus showcasing the added benefit AD biorefineries could have on reducing Washington’s GHG emissions. For more information on the sources and sinks of dairy based GHG emissions, the authors encourage readers to read the latest report by the EPA found here. In addition, more information on the Climate Friendly Farming study and how digesters can reduce GHG emissions in Washington State can be found here. EPA. 2014. Inventory of U.S. greenhouse gas emissions and sinks: 1990-2012. US EPA. Washington, DC. Han, J., Mintz, M., Wang, M. 2011. Waste-to-wheel analysis of anaerobic-digestion-based renewable natural gas pathways with the GREET model. Argonne National Laboratory (United States). Funding organisation: USDOE Office of Energy Efficiency and Renewable Energy (United States).